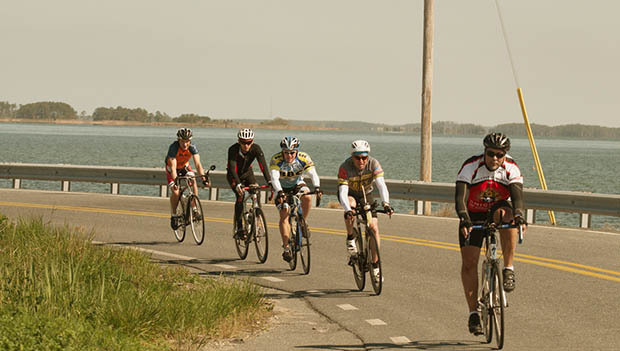 You don't have to be a competitive cyclist to enjoy the benefits of group rides. Utilized correctly, regular group sessions can motivate you, improve your fitness and make any ride more enjoyable. However, if you lack the technique or the fitness to ride with a group, the experience can be frustrating and leave you riding alone. In a worst-case scenario, lack of skills causes you to crash, perhaps taking others down with you. When you search for a group to ride with, find out their general policies. Some meet for "no-drop" rides. This means that no rider is left behind, and you can count on an experienced rider to stay with you. Inquire if someone in the organization teaches group riding etiquette. The third most common choice is a race thinly disguised as a group ride. These are usually the fastest and most aggressive rides available. These rides are for very experienced cyclists and carry catchy names like, "Everyone Gets Dropped", "Ride Till You Puke" and "Wednesday World Championships." You have been officially warned just by reading the title. A few basic skills are needed to successfully ride with any group. You must be capable of riding a straight line, controlling your speed, anticipating possible problems and watching the road ahead of you. At the same time, be alert for activity in your peripheral vision. If you have watched a professional cycling race, you know that every rider needs to "hold a line." This means that cyclists need to be capable of riding a line parallel with the edge of the road. Some group rides practice staying together as one large mass—more or less—with little movement among the group. Staying in the lead rider's slipstream is called drafting. Riders in the draft position save upwards of 30 percent of their energy compared to the lead rider. If you've ever had a chance to draft, you know that riding 20 miles per hour is significantly easier when you're following rather than leading. The difference is even more pronounced in a head wind. The lead rider in a pace line can stay at the front for just a few seconds or for several minutes. When you join a group that is rotating the lead position and it is time for you to lead, resist pouring on the gas to show everyone how strong you are. A pace line is happiest when the pace is steady. Fast accelerations or jerky braking motions disrupt the line and can cause a crash. The first person in the group can see clear road. Thus, they need to point out road hazards—as do the rest of the people in the line. Pointing out hazards and verbal communication skills are important. For this reason, do not use headphones in a group riding situation. Listen for cars approaching from the rear. A rear-view mirror mounted on your helmet or glasses can be very helpful when watching for cars. If you are riding in windy conditions or it is a hilly course, anticipate changes in the group or peloton. When the peloton changes directions, sometimes the weaker riders are no longer sheltered from the wind and they fall off the pace. The same is true for a hilly course. Riders that can usually stay with the group on flat roads can fall off the pace on a hill. This column just scratched the surface of group riding skills. Once you master the basics, you should continue to hone your skills. A good resource on mass riding is Racing Tactics for Cyclists by Thomas Prehn even if you are not a competitive cyclist. Remember: In group rides, smart riders often have the advantage over strong riders.